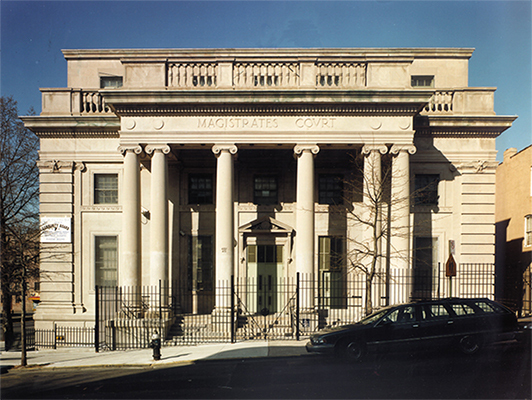 The Sunset Park [Brooklyn] Courthouse was no longer in use and gravely in disrepair when the NYC Department of Design & Construction hired Helpern Architects to restore and adapt it for use by the Police Department’s South Brooklyn Borough Command Center as well as by Brooklyn Community Board 7. The building was renovated specifically to support Mayor David Dinkins’ “Safe Streets, Safe City” program whose success – through community policing – greatly reduced violent crime in NYC by adding 6,000 police officers, as well as creating a far more diverse force. Work started in 1992 and was completed over 5 years. The total cost was just under $8-million. 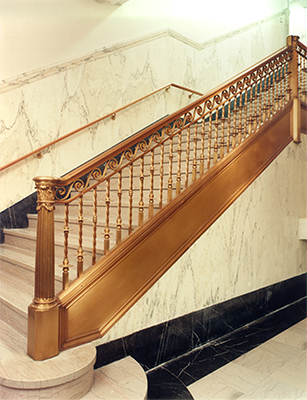 At the end of 1997, Sunset Park Courthouse received a New York Preservation Award from the Municipal Art Society, praising it as a “clear, obvious, wonderful” winner. 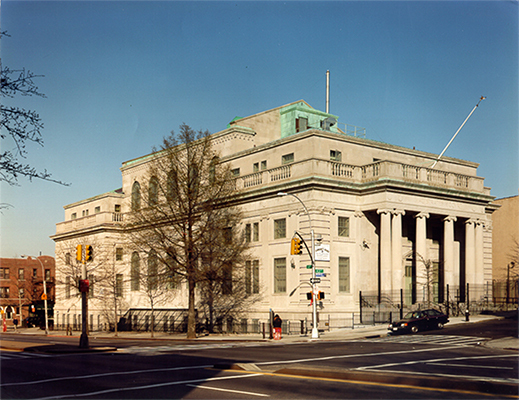 Built in 1931 at a time of great prosperity in a populous section of Brooklyn, Sunset Park Courthouse was notable for its fine porticos, Ionic columns, and tall Palladian windows. Architect Mortimer Dickerson Metcalfe designed it in Classical Revival style. Not designated a NYC Individual Landmark until 2001, Sunset Park was nonetheless a distinctive civic building and a neighborhood anchor. Helpern Architects repaired and restored the limestone-clad exterior. The two identical, opposite main entrances were made accessible to the disabled, and compatible new exterior lighting improved the safety of the perimeter. Inside, the restoration concentrated on the extensive bronze ornamental metalwork, fine plaster cornices, and the marble wainscoting, door casings, floors, and stairs. New, low partitions in what had been 25-ft-high courtrooms matched the height of that wainscoting as well as the window spacing. Unobtrusive raceways carried new electrical and computer wiring. The design also diminished the appearance of both fan-coil units for heating and air conditioning and also the new fire alarm system. Other work included a new elevator and all-new MEP systems.